Hello, everyone! Last month, I gathered a round-up of adaptation news from the past six to seven months that I had covered in my bookish rounds posts. The six to seven months was an arbitrary number, and I had missed some adaptation news in choosing that limit. I had also, however, gotten a few things wrong. For one, I had originally written that The 5th Wave adaptation was releasing January 15th; a week later, I realized that the date was set at January 22nd. I edited the post, but it turns out that I wasn't the only one with a mistaken idea of the release date. One of my friends, only a week ago, said that she had seen something that said January 15th. I assured her it was the 22nd, but that was the last straw. Certainly, there are a number of articles about reading the book before you see the movie, yet some of them also include movies that don't have set release dates. I thought that it would be useful to create a calender infographic of the upcoming 2016 young adult and middle grade adaptations. *Note: Not all of these are strictly Young Adult adaptations -- some are more "kidlit" (e.g. The Little Prince, Tuck Everlasting, etc.) and some had franchises in MG/YA but may not be anymore (e.g. Harry Potter & Cursed Child, Fantastic Beasts, etc. ), but I thought that all would be relevant to the YA community. Shadowhunters (The Mortal Instruments by Cassandra Clare) | Official Twitter Page | TV Show | Premiere: January 12, 2016 on Freeform / ABC Family | More clips at IMDB. The 5th Wave by Rick Yancey | Official Twitter Page | Movie | Release Date: January 22nd, 2016 | More clips at IMDB. The Divergent Series: Allegiant (part I) by Veronica Roth | Official Twitter Page | Movie | Release Date: March 18, 2016 | More clips at IMDB. The Little Prince by Antoine de Saint-Exupéry (Author/Illustrator), Richard Howard (Translator) | No official Twitter Page (?) | Movie | Release Date: March 18, 2016 (in the U.S.) | More clips at IMDB. The Jungle Book by Rudyard Kipling | Official Twitter Page | Movie | Release Date: April 15, 2016 | More clips at IMDB. Tuck Everlasting by Natalie Babbitt | Official Twitter Page | Broadway Musical | Opening Night: April 26th, 2016 | More clips at Official Website. Alice through the Looking Glass (Through the Looking Glass and What Alice Found There by Lewis Carroll) | Official Twitter Page | Movie | Release Date: May 27, 2016 | More clips at IMDB. The BFG by Ronald Doahl | Official Twitter Page (UK, not sure where US one is) | Movie | Release Date: July 1, 2016 | More clips at IMDB. Harry Potter and the Cursed Child by J.K. Rowling, Jack Thorne, and John Tiffany | Official Twitter Page | London play, 2 parts | Opening Night: July 30th, 2016 | More information at Official Website. Middle School: The Worst Years of My Life by James Patterson | No Official Twitter Page(?) | Movie | Release Date: October 7, 2016 | More information to come at IMDB. A Monster Calls by Patrick Ness | Official Twitter Page (& here?) | Movie | Release Date: October 14, 2016 | More clips to come at IMDB. Fantastic Beasts and Where to Find Them by J.K. Rowling | Official Twitter Page | Movie | Release Date: November 18, 2016 | More clips to come at IMDB. Let It Snow by Maureen Johnson, Lauren Myracle, and John Green | Official Twitter Page(?) | Movie | Release Date: December 9, 2016 | Maybe more information to come at IMDB. Miss Peregrine's Home for Peculiars (Miss Peregrine's Home for Peculiar Children (Peculiars) by Ransom Riggs) | Official Twitter Page | Movie | Release Date: December 25, 2016 | More clips to come at IMDB. Adaptations. Click to enlarge the image. *For these movies, the release date is listed as 2016, but the actual date has not been confirmed. Whether they will actually be released this year is yet to be determined. *Can't make a calender of adaptations without nodding to the successful ones that are still running! The third season of The 100 by Kass Morgan premieres January 21st. The sixth season of Pretty Little Liars by Sara Shepard returns January 12th. The seventh season of Vampire Diaries by L.J. Smith returns January 29th. *Note: Since Alex Skarsgård is playing Tarzan and has bulked up for the role, I figured that his character was probably not meant to be like the Disney version anymore. 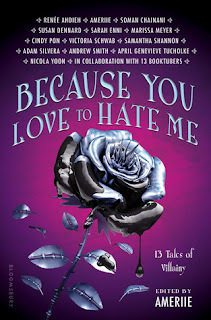 If you're wondering where I got all this information from, again last month, I gathered a round-up of adaptation news from the past six to seven months that I had covered in my bookish rounds posts. Those posts have all the links to trailers, posters, etc. 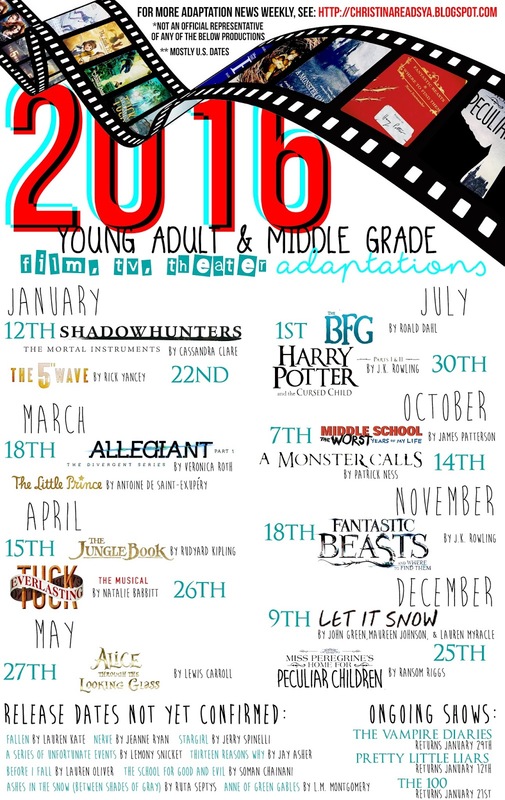 So those are the 2016 young adult and middle grade adaptations! Which ones will you be watching / seeing this upcoming year? Are you going to withhold your judgment on others? Let me know!